Each Order Contains 2 Square Number Blocks (number combinations 1 through 32 are possible) and 1 Rectangle Block with Weeks/Months/Years/Grade on each side. The Large block is 6" by 2" and Small blocks are 2" by 2" cubes. Includes gift box. Add an expansion block to allow for more number combinations (0-99+). 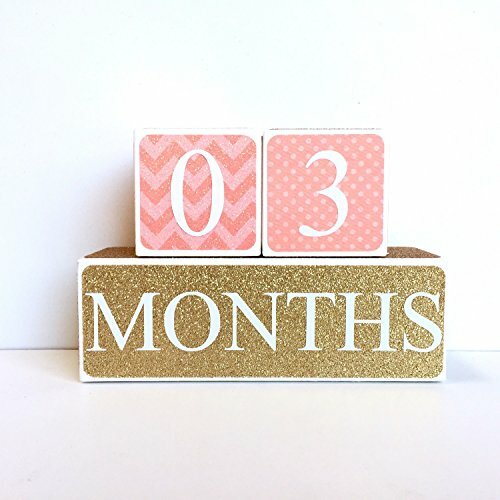 Make the perfect baby shower gift, or baby photopgraphy props.. Keep track of your babies age using these month numbered blocks. Also makes great nursery decor or baby decor. Manufactured from solid wood in the USA by a small family owner and operated business. EACH ORDER CONTAINS 2 Square Baby Number Blocks and 1 Rectangle Block that contains the words WEEKS, MONTHS, YEARS, and GRADE. NO STICKERS: We are the ONLY baby age block on the market that does not use stickers on their blocks that peel or wash off easily. REAL NATURAL WOOD: Made Eco and baby friendly wood that lasts a lifetime. Wooden age blocks that won't dent. PERFECT BABY SHOWER GIFT or BABY AGE PHOTO PROP: Hold on to memories by capturing your baby at each age milestone. 100% Satisfaction Guarantee: If you aren't completely satisfied with your order, we'll issue a full refund. If you have any questions about this product by Sweet Sage Studio, contact us by completing and submitting the form below. If you are looking for a specif part number, please include it with your message.